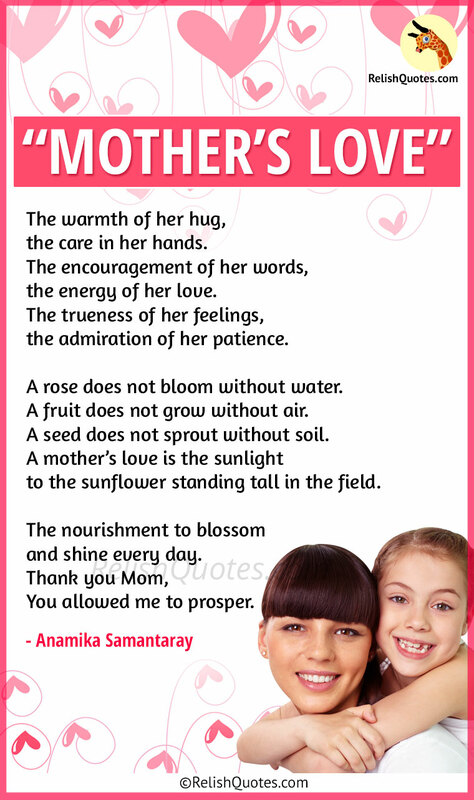 Mothers Day Poem - "Mother’s Love"
The warmth of her hug, the care in her hands. The encouragement of her words, the energy of her love. The trueness of her feelings, the admiration of her patience. A rose does not bloom without water. A fruit does not grow without air. A seed does not sprout without soil. A mother’s love is the sunlight to the sunflower standing tall in the field. The nourishment to blossom and shine every day. Thank you Mom, You allowed me to prosper.